Each month, profitable market centers split owner profits with the associates who helped grow the market center. The program is completely voluntary and available to any associate who wishes to participate. An associate becomes eligible for profit share when a productive agent names them as a sponsor; the person who introduced them to the company. Stakeholders earn profit share every month a market center is profitable. Last year, 98 percent of Keller Williams Market Centers were profitable for the year, a figure that far outpaces the industry standard. Once the employee reaches their three year anniversary with Keller Williams, they are vested for life. 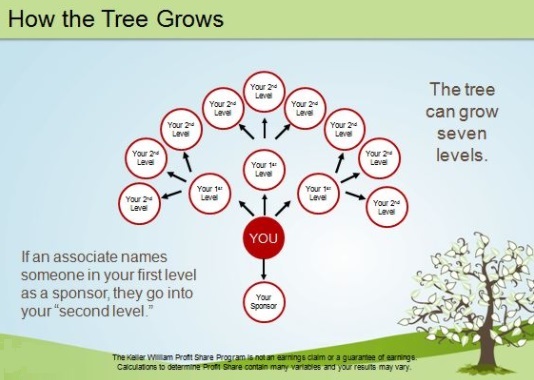 Now that you know what profit share is, you are ready to master the techniques for maximizing Keller Williams resources that help grow your profit share tree. Have you ever dreamed about what you would do with an extra $100, $1000 or $10,000 in passive income each month from profit share? In countries outside of North America, Keller Williams offers a growth share program in which master franchise owners and Keller Williams reward associates who help the company grow by sharing a portion of the company’s revenue with those associates. To learn more about the growth share model, download the growth share white paper. And don’t miss the opportunity to learn more about growth share by attending the next free growth share webinar. Reserve your seat here. Because any Keller Williams associate can participate in either of the two plans, and both Profit Share and Growth Share are distributed across borders all over the world, the two different systems create a powerful wealth-building platform for those who help Keller Williams grow and succeed.